Short work week and school week, hot damn! Then on to gut busting Thanksgiving dinner. American style. Let's start this week off with a little giggle. For the top of your Christmas Wish List – The Woman's Remote! This, my dear, is bloody brilliant! I need the snoring mute button!! We have colds so everyone, even the dog is snoring!! I didn’t sleep a wink last night!!! I LOVE IT!! Hehe, very funny! I could definitely use the mute snore too! How about a mute kids button? Can I order one from your Etsy or what???!!! Girl, you got that one right on the money! LoL! Thats great! Hey…it could happen! Too funny! I particularly like that Queen button. I love those Vintage wreathes!!!!!! Laura @ Robson and Mason Haberdashery. 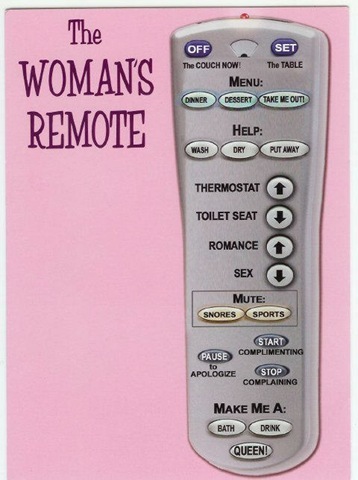 I need this remote. For seriously!